I think I started reading a bit too early (the whole GMT, IST thing is very confusing.) But does it really matter if I accidentally read for a couple of extra hours? I honestly can't recall the last time I felt so incredibly comfortable and involved in a book. Maybe when I read the entire Chrestomanci series (Diana Wynne Jones) in a single day. Or when that Harry Potter book, that I had been desperately waiting for for almost a year, finally came out. It wasn't more than a couple of times. I guess you're not always able to just drop everything else from your mind, avoid all possible distractions and throw yourself into a book. This read-a-thon is helping me realize how much I love reading and how little enjoyment I usually take out of this. The fact that this seems like the best book I have ever read (which it probably isn't) proves that I am loving every second of this. Really. I am making notes on little scraps of paper while I am reading the book, so that I can write instant reviews, something I'm not really used to. This is a library book, so writing notes in the margins is out of question... and I haven't exactly tried doing that ever. So I want to ask you, are you okay with actually writing inside books, in the margins or on that blank page at the end? Or do you just wait till the entire read-a-thon is over to write your views on the books that you read? If you're participating in this read-a-thon, I look forward to reading your updates as well. Lol at you starting early. I started a bit late because I didn't know how to make coffee and my mom and I were giving it a go. Happy Reading! Yeah! Go Priya! I'm glad you liked this book. 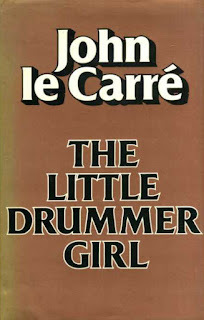 I've been planning on reading Le Carre all year. Now I know which book to read! You are making excellent process-keep it up! I love the Chrestomanci series too, glad to find a kindred spirit.